In the day-to-day travels of blood through the body, the aorta is our arterial Grand Central Station. It’s the largest artery in the body, extending from the left ventricle of the heart to the abdomen, where it divides into two smaller arteries. The aorta carries blood from the heart, newly flush with oxygen, to the rest of your body. 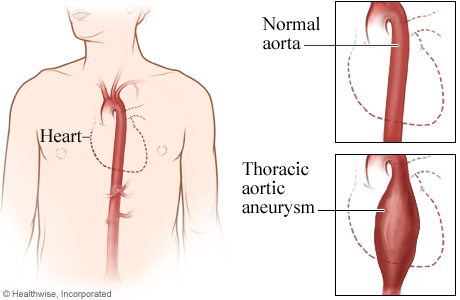 When diseased, the aorta can dilate (aneurysm) or split (dissection). A rupture is potentially fatal. An aneurysm in the area below the chest. History of heart disease or peripheral arterial disease. Elevated levels of fat in the blood (hyperlipidemia). An aneurysm in the chest. It’s rare, with only 6 to 10 cases reported per 100,000 people. Type A: A tear in the ascending aorta that can reach as far as the leg’s arteries. Blood flows through the aorta’s walls instead of being contained in the central channel, or lumen. Because of possible death from a stroke, heart attack, bleeding or congestive heart failure, immediate surgery is required. Type B: A tear in the descending aorta that can reach into the abdomen. Unlike Type A, this condition is treated -- at least initially -- by controlling blood pressure. A tear creates a second channel that begins to pool blood diverted from its normal pathway. If that accumulating blood continues to grow, it can press against other parts of the aorta and cause a narrowing that reduces blood flow. Uncertain, but high blood pressure can make the aortic tissue vulnerable to tearing. Narrowing or enlargement of the aorta. Severe, sudden pain in the abdomen or back that can spread to the buttocks, groin or legs. If you have an abdominal aortic aneurysm, you might not know it until it ruptures. An aneurysm can grow for years without noticeable symptoms until it gets so big that it pressures adjacent body parts or restricts blood flow. Your primary care physician might detect it a mass in your abdomen during your annual physical exam. If it’s about to burst, the area can be sensitive, and painful, to the touch. Through a doctor’s stethoscope, your blood flow might even sound different. In either of these cases, your doctor will immediately refer you to a cardiothoracic or vascular surgeon. Computed Tomography Scan (CT scan). In the best circumstances, an aneurysm will remain small and require nothing more than medication to control your blood pressure, reducing the risk of a rupture. An aortic dissection, however, is a life-threatening condition that requires immediate treatment. Less than half of people with a ruptured aorta survive. Surgery is needed for any dissection in the part of aorta leaving the heart (ascending). Elsewhere in the order (descending), treatment is either medication or surgery. 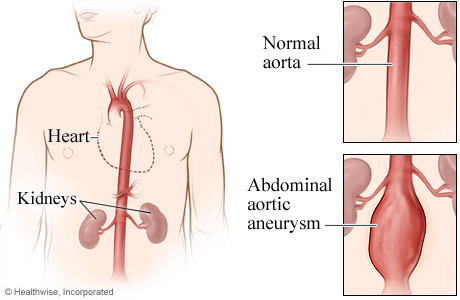 Open Chest (or Open Abdominal): A large incision in the abdomen exposes the aorta, allowing the surgeon to replace a section of it with a graft. After the surgery, which can take up to six hours, you’ll stay in the hospital for 5 to 8 days. Endovascular repair: This procedure, which does not require a major incision, uses a graft to reinforce the aorta. Instead of removing part of this main artery, surgeons use catheters inserted into the arteries to place the graft made out of Teflon or other synthetic material. A team of physicians at the Heart & Vascular Institute in summer 2017 became the first in Connecticut to repair a life-threatening aortic aneurysm using a new device as part of a clinical trial approved by the Food & Drug Administration. The procedure uses components packed into a flexible, hollow tube called a catheter that’s placed in the aorta through an artery in the leg. At the time of this writing, the use of the study device is not yet available to the public. To qualify to receive the device, patients must consent to be part of the clinical trial and must meet strict inclusion and exclusion criteria. This is part of the Heart & Vascular Institute’s continuing efforts to bring the latest, and safest, treatments to our patients.